Julia Greenstreet, Curatorial Assistant, Kenneth Tyler Collection, reflects on the prints of Anni Albers – one of the 20th century’s most influential textile artists and a brilliant printmaker. 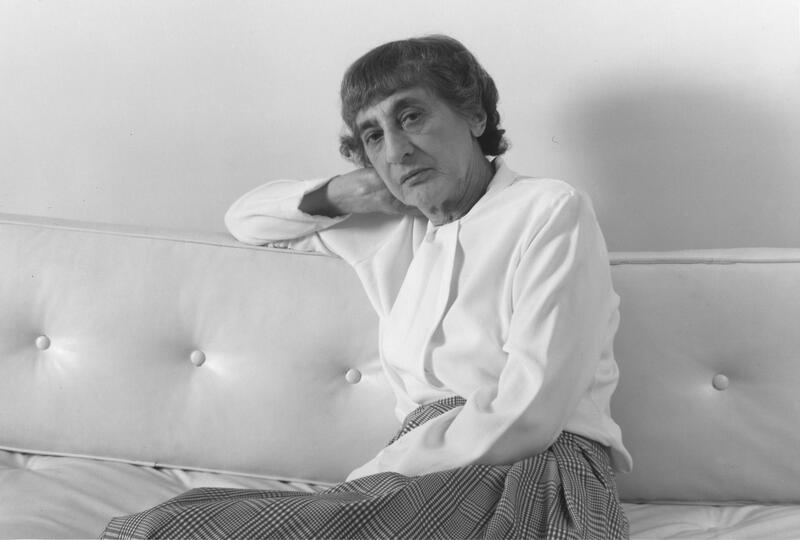 Anni Albers (1899 – 1994) began her career as a weaver and only turned to printmaking when she was in her sixties. At the core of both her textiles and prints are a set of fundamental principles established during her years at the Bauhaus Weaving Workshop which guide her creative process and approach to making. Albers’s is an art based on the pursuit of universality and timelessness, anonymity rather than individualism, an intimate knowledge of and respect for materials and techniques, and a playful sense of order and balance. 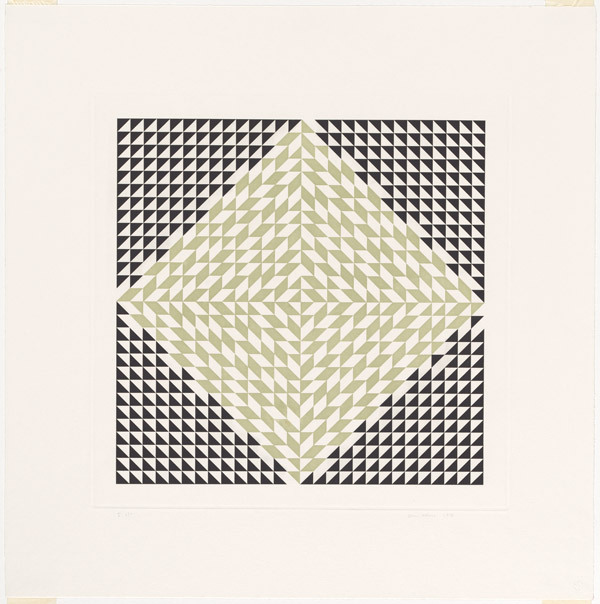 Much like her introduction to weaving as a young artist, Albers’s first encounter with printmaking was not planned. Her career in the graphic arts began with a serendipitous visit in 1963 to Tamarind Lithography Workshop, Los Angeles, an institution at the forefront of a revival in fine art printmaking which was taking place in the United States at that time. It was not an interest in lithography that brought Albers there, but rather her husband Josef, who was working at Tamarind as a Fellow and whom she would often accompany. Aware of Albers’s talents as a textile artist, Tamarind’s Director June Wayne encouraged her to try lithography for herself. This proved to be a watershed moment in the artist’s career; Albers was instantly seduced by the possibilities of printmaking. After 40 years of weaving, Albers could ‘take a line for a walk’ like never before. 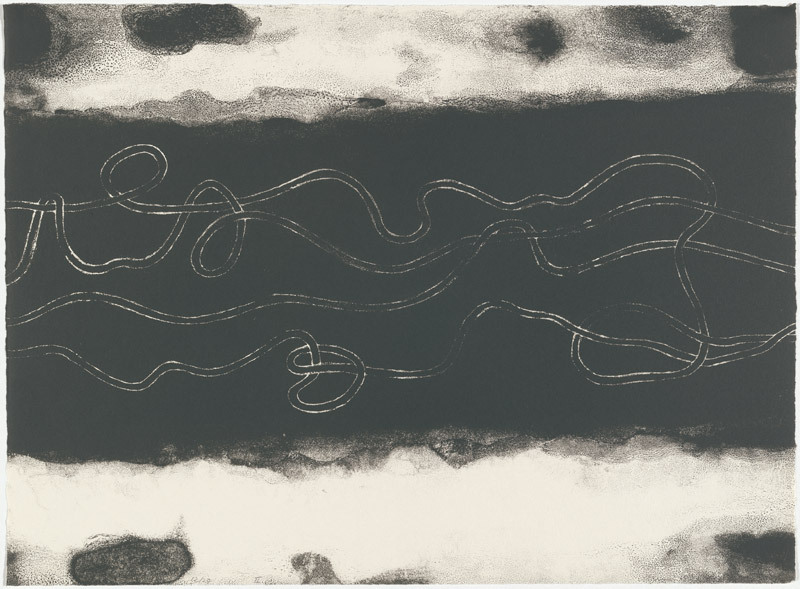 She said of this period, ‘I found that, in lithography, the image of threads could project a freedom I had never suspected.’ The artist’s joy in this newfound freedom is evident in her first print edition, the Line involvements suite of six lithographs. These works are uncharacteristically painterly and loose in structure, featuring billowing washes for the ground and dynamic arabesques created by thread-like forms. With the flourish of a painter the ground was created by etching with acid, applying crayon with a rag, or streaking with lithographic tusche. 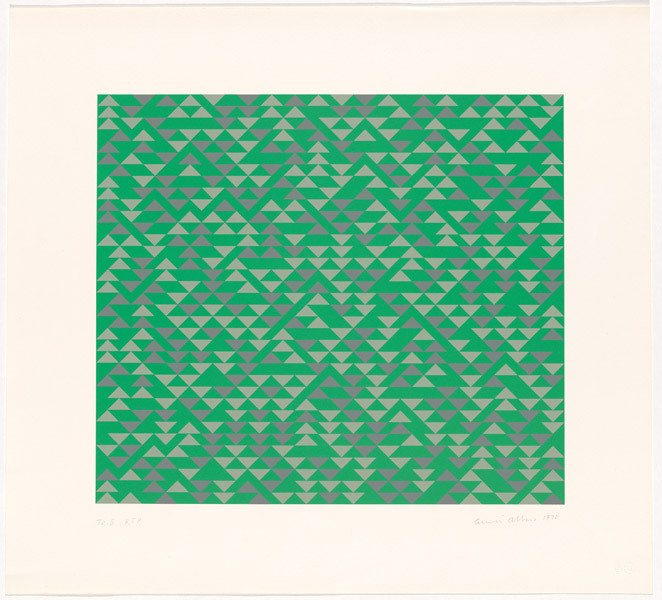 After 1963, Albers never again worked on a weaving herself (although she did occasionally design textiles). Over the course of a prolific career spanning 40 years, textile design and appreciation had blossomed at her hands, however for Albers it was time to take on a new challenge and she focussed solely on printmaking until her death in 1994. She worked with Ken Tyler for the first time at Gemini GEL in 1970, marking the beginning of what was to become a fruitful, close collaborative relationship with the master printer. The more we avoid standing in the way of the material and in the way of tools and machines, the better chance we have that our work will not be dated, will not bear the stamp of too limited a period of time and be old-fashioned some day…And it will outlast fashions only if it embodies lasting, together with transitory, qualities. 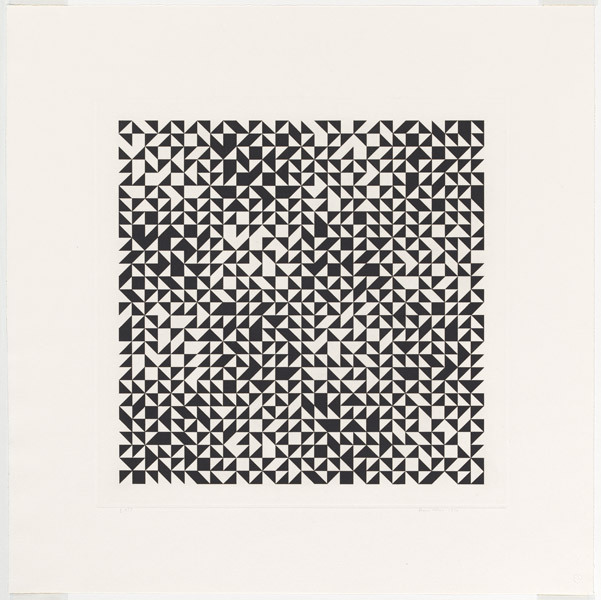 Albers’s pursuit of anonymous form and her fascination with machines and technology was perfectly aligned with the mechanical processes of print, which could produce works of a highly polished, industrial aesthetic. Ken Tyler had a reputation for ‘technical wizardry’ and for producing prints of the highest quality; his workshop was a state-of-the-art facility with the best presses and expert staff, and his in-depth knowledge of print technology combined with his sense of adventure made him the perfect printer for Albers. The first series Albers made with Tyler was Triadic. These works feature the triangle, a key, recurring motif in Albers’s oeuvre. All three are made from the same master design, but printed in different colour palettes, or in the case of TR III, embossed onto a silkscreened gold ground. 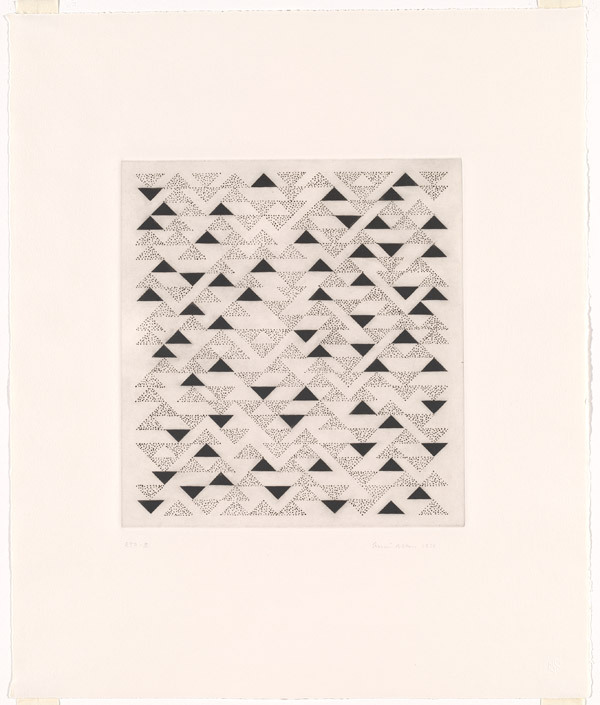 Lithography allowed Albers to create triangles of perfect linearity, which must have given her quite a kick after years of employing not-quite-straight triangles in her weavings. As a student Albers was greatly influenced by Goethe’s Metamorphosis of plants, which explains the structure of organisms as being made up by repeated yet varied like units. Albers came to define weaving as the ‘building up out of a single element, to building a whole out of single elements,’ much like architecture. She utilised this approach in her printmaking too; in the Triadic series triangles function as individual units from which a whole composition is built. These works are interesting for the way in which they achieve balance and harmony without relying on formula or symmetry. Taking her cue from structures of the natural world, Albers ultimately aims to create order in her art, but an order, ‘in a not too obvious way, an order puzzling to the onlooker, so that he will return again and again […] mystery is what draws us to art.’ It is this mystery that intrigues and makes us want to take another look. Albers experiments with texture in TR III, where embossing is used to create a sculptural surface of raised and lowered planes. In doing so the artist brings some of the tactility and texture of her woven work to screenprinting, which is an inherently flat medium. 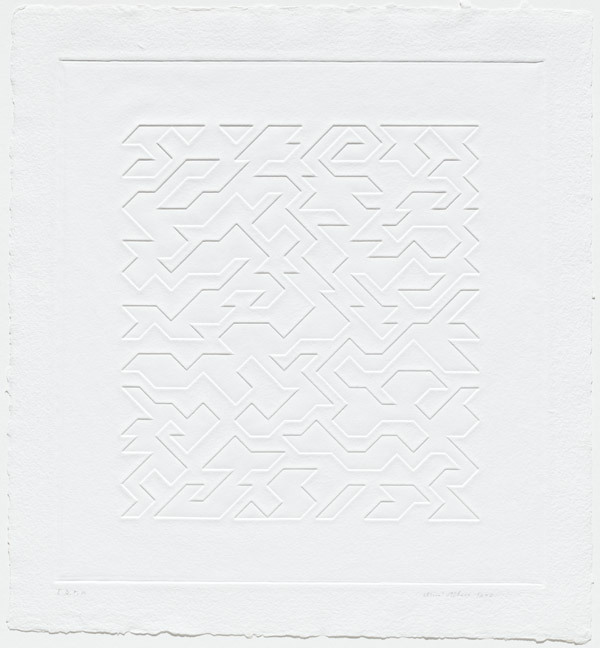 She continued this idea in the 1978 series Mountainous, produced by embossing white paper with incised copper plates. These works have an airy, open quality which is emphasised by the absence of colour. A hallmark of Albers’s graphic work is an ambiguous relationship between figure and ground and these works are wonderful examples of that push and pull. While Albers always maintained a self-effacing approach to art making, her works are nevertheless personal expressions reflecting a reality, and in the title of this series – Mountainous – she evokes the Andean mountains or monumental ancient sites in Mexico which she had visited so many times. 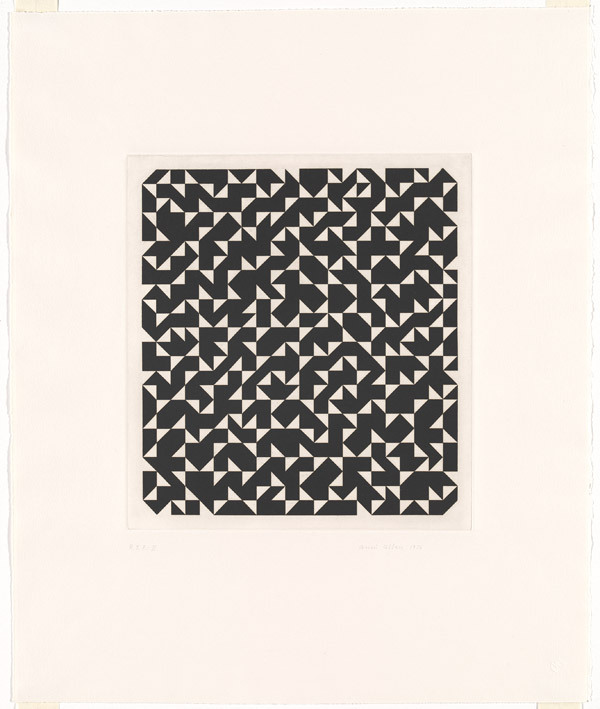 Rather than relying on representational imagery to convey meaning, Albers uses abstract visual forms. 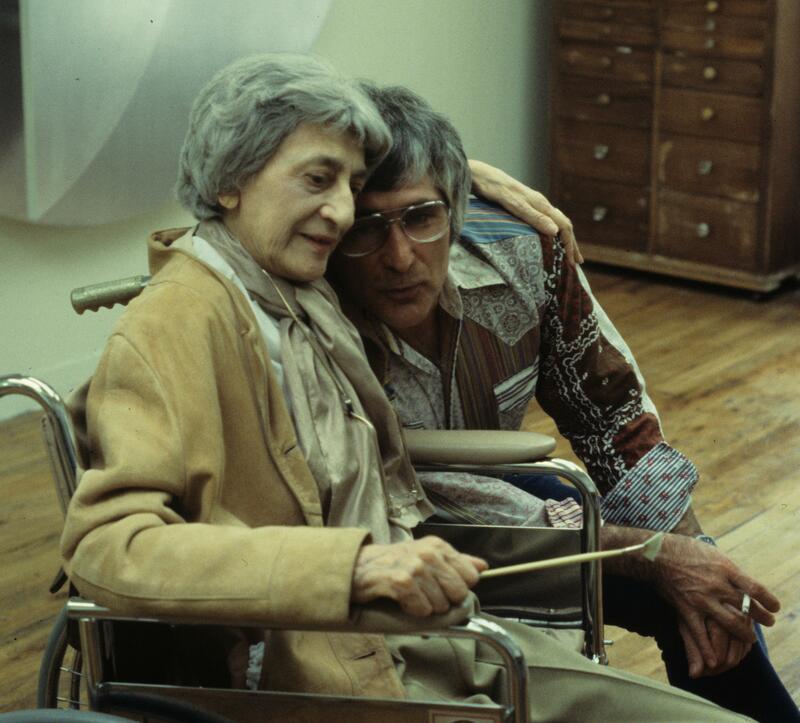 In 1976 Albers visited Ken Tyler at his new workshop in Bedford Village, New York. 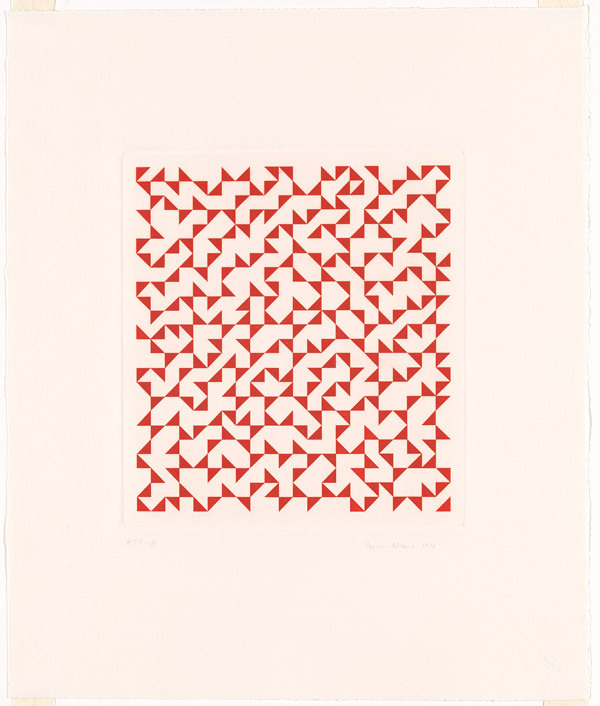 At Tyler’s suggestion, Albers – now in her late seventies – tried etching for the first time. The resultant Triangulated intaglios series features etching and aquatint, two common intaglio techniques. Triangulated intaglio III uses both, with solid black triangles in aquatint balanced against subtle areas of etched dots. Albers organises these elements within the pictorial field contained by the embossed edge, which is created during the printing process. 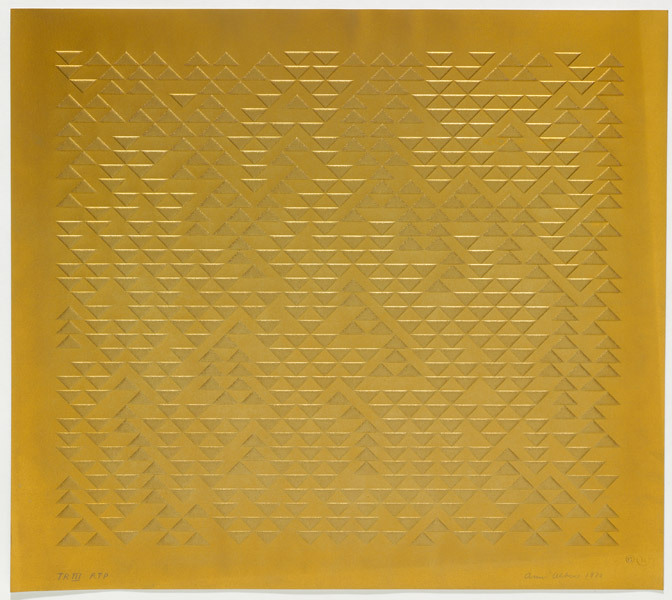 This edge was a feature of intaglio that Albers particularly liked as it provided a process-based solution as to how to focus and contain her designs. She has stated that the printing was as important to her artwork as the initial design concept, emphasising the significance of process to her work. Triangulated intaglio IV and Triangulated intaglio II are based on the same design but IV was printed in red ink in the opposite areas to where black appears in II, switching the figure-ground relationship entirely and consequently producing two distinct results. 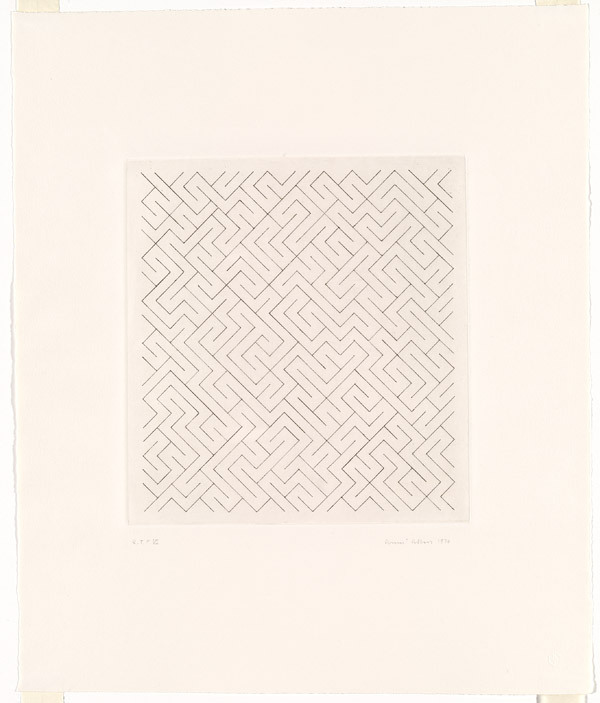 In Triangulated intaglio VI the tessellated shapes of the other works are replaced by a maze-like line design, showing just how versatile and inventive Albers could be within the confines of the grid. Paul Klee, quoted in Nicholas Fox Weber, ‘Anni Albers to date’ The woven and graphic art of Anni Albers (Washington, D.C.: Smithsonian Institution Press 1985) p 19. Anni Albers, ‘Design: anonymous and timeless’ Magazine of Art vol.40 no.2 February 1947, pp 51-53. 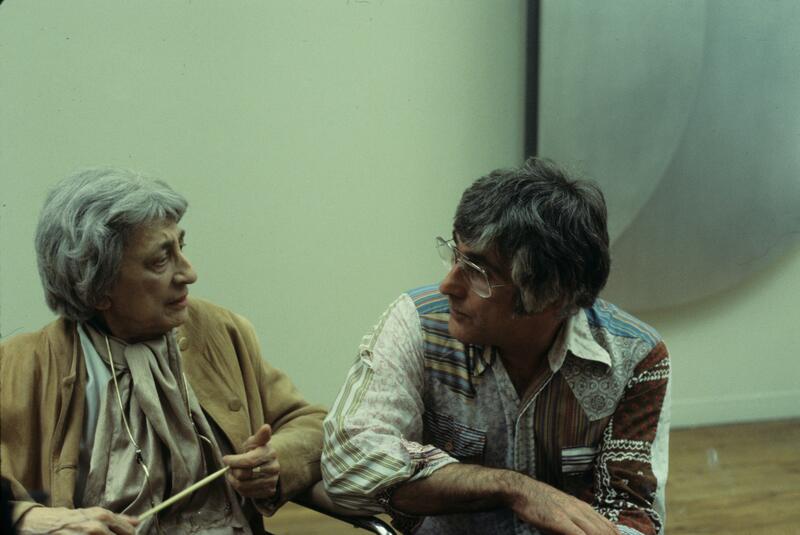 Oral history interview with Anni Albers, 1968 July 5, Archives of American Art, Smithsonian Institution.